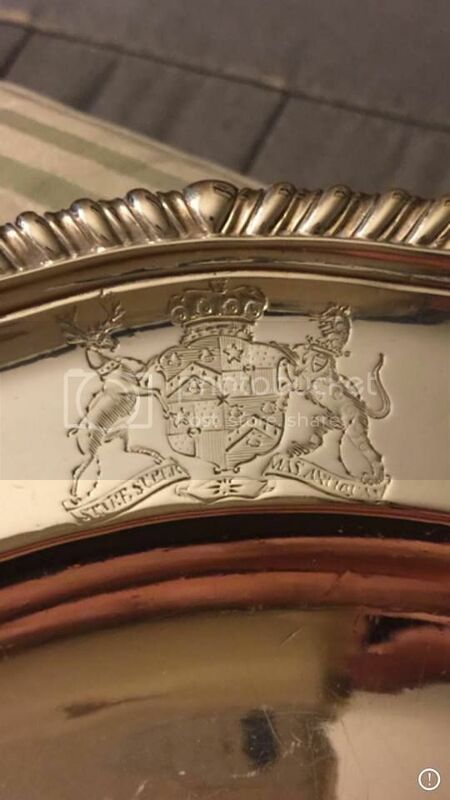 The hallmark shows that your plate was assayed in London during the assay year 1770/71 and was made by the partnership of John Parker & Edward Wakelin. The armorial in your first picture is that of the owner, whose name you may well be able to discover with a little research - or help from some of our contributors who know about these things. 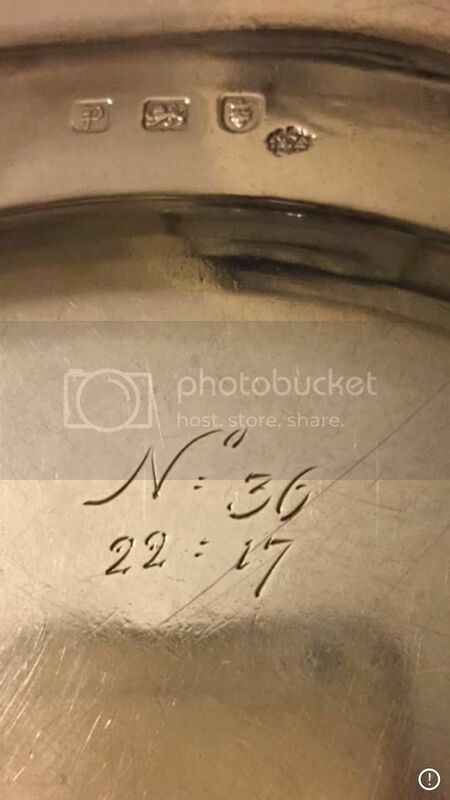 The "No 36" indicates that this was part of a larger inventory, or possibly set of plates, and I suspect that the "22 : 17" may be the weight in troy ounces and pennyweights (corresponds to about 711 grams). Anyone knows anything on the first photo? The motto is: Stare Super Vias Antiquas - To Stand Upon the Old Ways. There appears to be a connection to Baron Bayning, but I don't think it's him. I'll move the topic to the 'Family Crests' section of the forum. The ledgers of Parker & Wakelin have survived, I believe they are in the V & A, but they have been published in book-form. Fairbairn's Crests translates the motto as "To pursue the track of my ancestors," and ascribes it to Bayning, Powlett, and Townshend. The coronet above the coat of arms is that of a Baron. The arms appear to be those of a younger son of the Viscount Townshend, which are identical except for the mark (possibly a five-pointed star? for a third son) in the middle. Given the dates for this silver, it may be one of the sons of Charles, 3rd Viscount Townshend, b 1700, d 1764. Yet the younger sons of the 3rd Viscount each died before the date of this silver. Charles, Chancellor of the Exchequer 1766, d 1767. 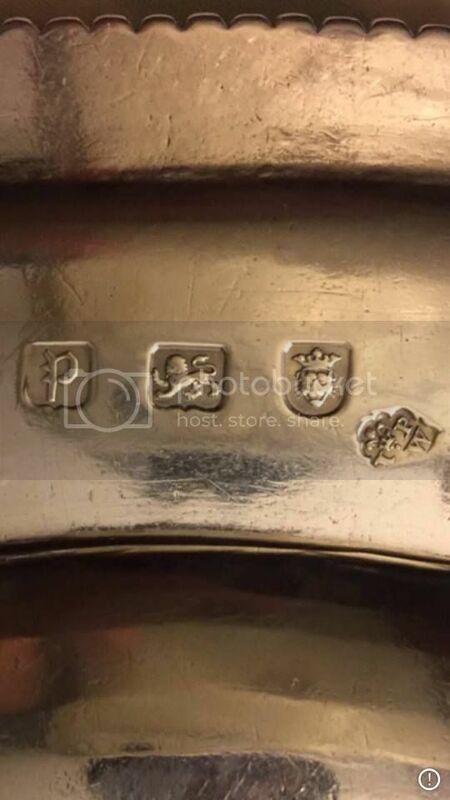 I suspect the dates of birth of the grandsons of the 3rd Viscount are too late for the dates on the silver, as they would have been in their teens, the eldest having been born in 1755. The arms of Viscount Townshend are blazoned: Quarterly: 1 and 4, Azure a chevron ermine between three escallops argent (for Townshend); 2 and 3, Quarterly gules and or in the first quarter a mullet argent in the center a crescent sable (for Vere). So the translation of the motto “ Stare Super Vias Antiquas” is “To pursue the track of my ancestors," or To Stand Upon the Old Ways? Which one is it? If you read carefully - the meaning of both translations is actually the same, the first being more literal, the latter as a metaphor with the same meaning. Now that we know it is historically interesting, any chance of full photos and measurements for the record? Could it be a charger?